Panther Westwinds build some outrageous cars in their history. This neo-classic is actually pretty tame compared to some of their cars (it only has four wheels, is what I mean). When it was introduced in 1974, there were already a few neo-classics on the market, but so many more were yet to come. The body was meant to evoke the Bugatti Royale. The engines were Jaguar-sourced – either a straight six or an optional V-12. The original owner of this car opted for the latter and it made about 282 horsepower. 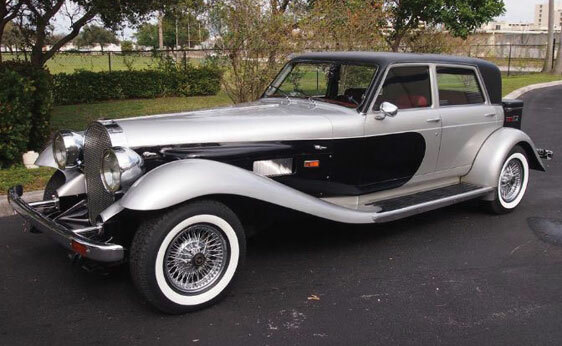 The car was named De Ville and, as you would expect from a car that looks like this and has that name, one was used (not this one) in the 1996 live-action version of 101 Dalmatians (the one with Glenn Close playing Cruella De Vil). I think that one was a coupe or convertible – I haven’t seen the movie in a while. Only 60 DeVilles were built in total, with the sedan being the most popular bodystyle with 48 built. This one is original with original paint. It has new tires and has had mechanical freshening and is ready to go. I’ll call it a $35,000-$45,000 car. Click here for more and here for more from Auctions America. This entry was posted in Uncategorized and tagged 1977, auctions, auctions america, cars, classic cars, deville, panther by ClassicCarWeekly. Bookmark the permalink.